TBE buffer is a buffer solution made up of Tris base, boric acid and EDTA (or Tris-borate-EDTA altogether). This buffer is often used for agarose gel electrophoresis in the analysis of DNA products resulting from PCR amplification, DNA purification protocols or DNA cloning experiments. TBE buffer is particularly useful for separation of smaller DNA fragments (MW < 1000), such as small products of restriction enzyme digests. TBE has a greater buffering capacity and will give sharper resolution than TAE buffer. TAE buffer is a solution made up of Tris base, acetic acid and EDTA (Tris-acetate-EDTA). An EDTA (ethylenediamine tetraacetic acid) solution should be prepared ahead of time. EDTA will not go completely into solution until the pH is adjusted to about 8.0. For a 500-milliliter stock solution of 0.5 M EDTA, weigh out 93.05 grams of EDTA disodium salt (FW = 372.2). Then dissolve it in 400 milliliters deionized water and adjust the pH with NaOH. After that, top up the solution to a final volume of 500 milliliters. Make a concentrated (5x) stock solution of TBE by weighing 54 g Tris base (FW = 121.14) and 27.5 g boric acid (FW = 61.83) and dissolving both in approximately 900 milliliters of deionized water. Then add 20 milliliters of 0.5 M EDTA (pH 8.0) and adjust the solution to a final volume of 1 liter. This solution can be stored at room temperature but a precipitate will form in older solutions. Store the buffer in glass bottles and discard if a precipitate has formed. For agarose gel electrophoresis, a TBE buffer can be used at a concentration of 0.5x (1:10 dilution of the concentrated stock). Dilute the stock solution by 10x in deionized water. Final solute concentrations are 45 mM Tris-borate and 1 mM EDTA. The buffer is now ready for use in running an agarose gel. To make TBE buffer, you'll need just four substances. The remaining items on this list are equipment. The four substances required are EDTA disodium salt, Tris base, boric acid and deionized water. As for equipment, you'll need a pH meter and calibration standards, as appropriate. 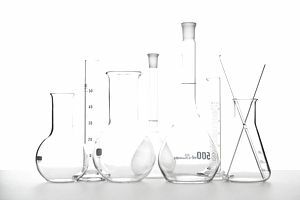 In addition to that, you'll need 600-milliliter and 1500-milliliter beakers or flasks. Rounding out your equipment needs are graduated cylinders and stir bars and stir plates. Check ​the inventory at the lab you'll be using to make sure you have everything you need before you get started. Nothing's worse than having to stop in the middle of preparing a solution because you've run out of the proper materials. If your lab is at school or your work site, check with the proper personnel to see that they have all the items in the stock. Doing so may save you time and energy in the end.